It’s time to stop moneyed conservative interests from trying to buy or steal our democracy. We know the problem—let’s get to the solutions. Since the 1880s we’ve seen how money shouts, and since the 1980s we’ve watched regressives seek to restrict the freedom to vote, culminating last year in the explosion of Super PAC spending and voting rights restrictions. This time, the efforts of the Adelsons, Kochs and Roves largely failed (at the federal level). But the economic elites will be back to attempt their hostile takeover of our democracy with even more money and sophistication. Hence MoneyOut/VotersIn Day in some sixty cities on January 19. That’s when a large coalition of public interest, labor, voting rights and faith groups are aspiring to a “more perfect union” on the confluence of the third anniversary of Citizens United, the weekend celebration of MLK and the Presidential Inauguration. Generations of traditional campaign finance groups have worked against a democracy-for-sale. And heroic voting rights groups have long sought to fulfill Dr. King’s plea at the Washington Monument in 1957: “Give us the ballot! Give us the ballot!” But rarely have these two communities worked together to stop the rigging of the political system. Until we ensure that popular majorities become public law, it will be hard to accomplish so much of what is urgent—a more progressive tax code, immigration reform, climate change legislation, a living wage, labor reform and gun violence reduction. So on January 19, scores of groups and thousands of people around the country will organize around a three-part Democracy-for-All program: a constitutional amendment to overturn Citizens United; public funding of public elections, in Washington and state capitols; and guaranteed voting rights so potentially 50 million more Americans can vote before or on a National Holiday in November. First, reverse Citizens United. A momentary five-justice majority in this case tried to assure that a plutocracy of donors supplant a democracy of voters. As for the view that, well, both capital and labor will now be able to spend without limit in elections, the reality is that capital has 3,000 times more wealth than labor, the Koch brothers alone with a net worth more than all unions in America. Senator John McCain is right when he calls the decision the worst in a century. How can “originalists” like Justices Scalia and Thomas ignore the historical reality that the founders intended the First Amendment apply to actual people, not corporations, which never appear in the Constitution? How can Justice Kennedy make believe that “the appearance of influence or access…will not cause the electorate to lose faith in our democracy” if Sheldon Adelson spends, say, $40 million on someone’s behalf and then calls the winning candidate with his ideas on lowered capital gains rates? How can big interests and their apologists hide behind the First Amendment when money is literally property, not speech? But then, like segregationists who hid behind “property rights” and “states rights,” today’s powerbrokers pretend that they are merely the modern equivalent of silenced minorities. Walmart is not Tom Paine or Fannie Lou Hamer. It’s one thing for money to buy companies in a system of capitalism based on the private pursuit of profit—but quite another for money to buy congressmen with trillions in shareholder wealth collected for commercial, not political, purposes. There is an almost comical irony in the law creating corporate charters to raise private capital for business purposes…and then allowing these creations to use that privilege to privatize democracy itself. Surely the Supreme Court can figure out how to condition a privilege, so that corporations can contract and enjoy police protection, but not vote, marry or drown out other voices with an ocean of paid political commercials. By lopsided margins, the public opposes the current system of purchased politicians and supports overturning Citizens United by amendment or a new Court decision. (Eighty percent favor one and 70 percent would make Super PACs illegal.) While the exact language of an amendment might vary, one version could simply state that money isn’t speech and can, in the electoral context, be regulated like excessive decibels and pollution are by sound/place/manner laws and environmental rules. There are currently 125 members of Congress, eleven states and 350 cities and towns that have called for a constitutional amendment. Obviously, no state resolution can force a constitutional conclusion, but together they can help create a climate for change, the way hundreds of local referenda for a nuclear freeze in the early 1980s spurred nuclear arms reductions in later Reagan-Gorbachev summits. Next, enact “Democracy Funding.” There are successful versions in New York City, Maine and Arizona. Essentially, either a critical mass of small donations generate a multiple of public matching funding (in New York City, donations from city voters of $175 or under are matched six to one) or candidates can voluntarily opt in to a system where, if they reach a minimum threshold of donors, they receive a fixed amount of public funds to run for office. Compare the New York City system with matching “democracy funding” and the New York State system without it. Small donations (under $250) account for 55 percent of campaign funds raised in City races but only six percent of State races. Forget 1 percent vs. 99 percent. Given the ethic that you don’t bite the hand that funds you, who is in charge when .5 percent of eligible voters comprise 100 percent of all campaign treasuries in NYS? That’s why a Fair Elections Act creating publicly financed state elections is about to be debated in Albany. Yes, public funds are involved. But either we have a system of the private funding of public elections—with the hundreds of billions in corporate welfare that result—or we have the public funding for public elections just as we now pay for voting machines and election personnel to administer that Tuesday. New York State has learned that two dollars a voter would pay for a program covering statewide races. Is not our democracy more valuable than one aircraft carrier? Then there’s Universal Voter Registration. Voter fraud is essentially nonexistent. 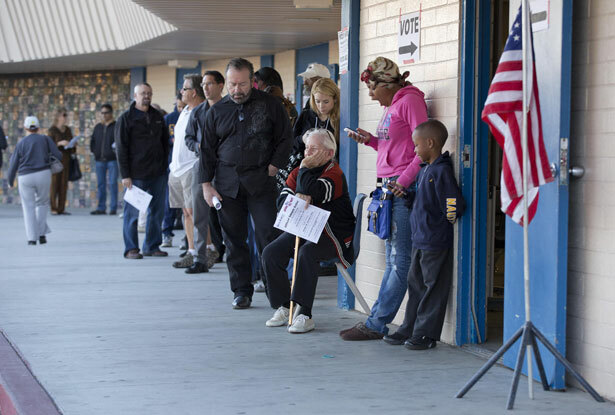 Meanwhile, some state laws have seven-hour lines for people to exercise their right to vote. As used successfully in many Western European countries and as prominently advocated by the Brennan Center for Legal Justice at NYU, a system of universal registration based on various data bases, like Social Security at birth, could automatically enroll people at 18, creating some 50 million more voters. Many states—led by Oregon and Washington—have shown that a mix of voting-by-mail, early voting, and same day registration can boost participation by 20 percent points or more. As part of a federal Voter Empowerment Act, it would be also ideal if Congress could create a National Democracy Day on a Saturday in November rather than a working day. There are many important steps to save our democracy, from filibuster and gerrymander reforms to the DISCLOSE Act, from the IRS finally investigating tax-deductible groups spending massively in political campaigns, to requiring shareholder resolutions before a company politically spends over a certain amount. But if the three essential elements of a Democracy-for-All Act were enacted, they would fundamentally forever alter who runs, who wins and whom they respond to once in office. But the only way any or all of this can occur is for candidates to fear and hear from voters more than donors. That’s precisely what happened right after the Watergate scandal, when Congress enacted strong new laws limiting spending and corruption. Now is another opportune moment. After the recent backlash to secret Super PACs and to voter suppression laws—and the election of Obama, who denounced Citizens United to the justices at this 2010 State of the Union and who election night 2012 said of long lines of voters, “We have to fix that”—we demand democracy! If not January 19, then when…and if not us, then who? Learn more about MoneyOut/VotersIn Day here. And see what the score is on reform at Voting Rights Watch, which last wrote about Republican Governor Bob McDonnell’s support for restoring voting rights to nonviolent felons. Robert WeissmanRobert Weissman is president of Public Citizen, which co-chairs the Coalition for Sensible Safeguards.